Extremely rare English map of the Philippines. Chart of the Philippine Islands, from the Spanish Chart, witht Adjacent Islands. 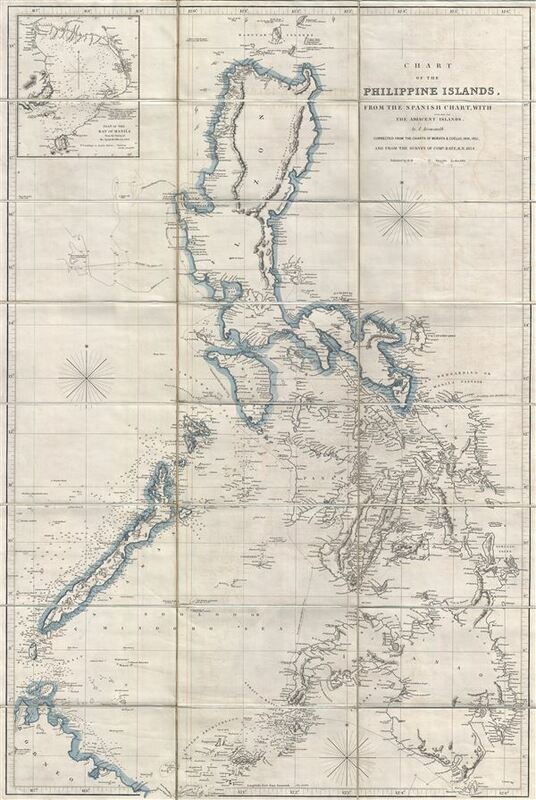 An attractive example of Aaron Arrowsmith's scarce 1862 map of the Philippine Islands (Philippines). Centered on Manila, Arrowsmith's map covers the entirety of the Philippine Islands from northern Luzon to the southern tip of Mindano. An inset in the upper left offers a detailed chart of Manila Bay according to Spanish surveys of 1819. Arrowsmith based this map upon the 1854 survey of Commander Bate, as well as the landmark 1841 - 1851 work of the Spanish cartographers Coello and Morata. It represents the most updated cartography of the Philippines available at the time. One's attention must be immediately be drawn to the interior, which even as this map was made in the mid-1800s, was little known. The map is inscribed to Aaron Arrowsmith who initially published a variant in 1812. It subsequently went through several updates and revisions, most likely some by A. Arrowsmith's son of the same name. A secondary inscription under the title is obscured, but is that of Richard Holmes Laurie, son of Robert Laurie, who is responsible for the most recent updates. The map folds into a slipcase bearing the bookplate and imprint of James Wyld. This is doubtless James Wyld the younger, who published maps well into the 1880s. Wyld most likely had no hand in the production of this map, but rather simply sold it through his retail location. We should note that all editions of this map are exceedingly scarce, but the first edition is the most common. We have found only one example of this updated edition in the archives of the Royal Maritime Museum, Greenwich, England. Aaron Arrowsmith (1750-1823), John Arrowsmith (1790-1873), and Samuel Arrowsmith. The Arrowsmith family were noted map engravers, publishers, geographers, and cartographers active in the late 18th and early 19th century. The Arrowsmith firm was founded by Aaron Arrowsmith, who was trained in surveying and engraving under John Cary and William Faden. Arrowsmith founded the Arrowsmith firm as a side business while employed by Cary. The firm specialized in large format individual issue maps containing the most up to date and sophisticated information available. Arrowsmith's work drew the attention of the Prince of Wales who, in 1810, named him Hydrographer to the Prince of Wales, and subsequently, in 1820, Hydrographer to the King. Aaron Arrowsmith was succeeded by two sons, Aaron and Samuel, who followed him in the map publication business. The Arrowsmith firm eventually fell to John Arrowsmith (1790-1873), nephew of the elder Aaron. John was a founding member of the Royal Geographical Society. The firm is best known for their phenomenal large format mappings of North America. Mount Arrowsmith, situated east of Port Alberni on Vancouver Island, British Columbia, is named for Aaron Arrowsmith and his nephew John Arrowsmith. Very good. Minor transference. Some minor damage to imprint under title. Dissected and laid down on linen. Folds into original linen slipcase the J. Wyld stamp. National Maritime Museum, Greenwich, London, WSK271:6/21.